BEIJING (CNN) -- In the wake of deadly anti-Chinese riots, authorities have imposed a curfew on a town in far western Xinjiang province, police and residents said Monday. "A circular has been issued and broadcast on television ordering people not to go out after dark," said one local resident. "We don't go out after sunset. There is curfew every night." At least 10 people were reportedly killed and dozens wounded when about 1,000 Muslim separatists of the Uighur ethnic minority rampaged through Yining last Wednesday, smashing cars, burning shops and beating up Han Chinese to protest Beijing rule. The riot erupted after a Chinese policeman tried to arrest a Uighur (pronounced wee-ger), according to one Chinese source with close ties to the government. "The scene attracted neighbors and onlookers and the crowd swelled to more than 1,000 and turned into rioting," he said. Rioters attacked ethnic Han Chinese on sight, smashed cars and set fire to shops, forcing local authorities to send out about 1,000 police and paramilitary police to quell the violence, according to a Han businessman. Security forces arrested 400 to 500 people, according to a police officer who refused to give his name. Some of those arrested were later released. Local officials described the riot as a small incident fueled by unidentified "foreign hostile forces," but the police officer said it was the worst rioting in Xinjiang since the 1949 Communist takeover. 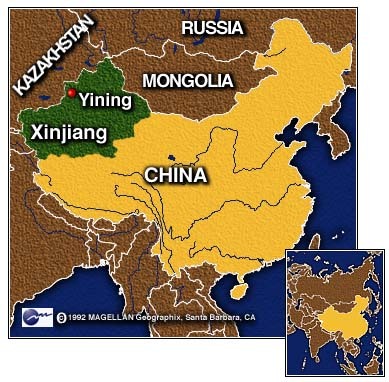 Ethnic clashes are not unusual in Xinjiang, where Muslims are the majority and the ruling Han Chinese make up only 38 percent of the population. 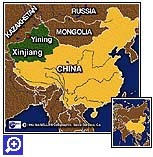 Yining is about 440 miles (700 km) northwest of the Xinjiang capital, Urumqi.